Texas Senator slams Trump over neutrality, proclaims support for Israel over terror. 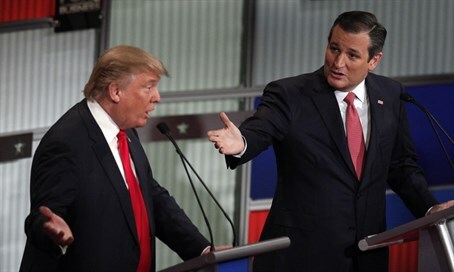 Texas Senator and presidential hopeful Ted Cruz repeatedly slammed Republican frontrunner Donald Trump’s statements regarding Israel and the Palestinian Authority. Referring to the New York billionaire’s comments last week during an MSNBC town hall event in South Carolina that he would be “neutral” in dealings between Israel and the Palestinian Authority, Cruz emphasized his support for the Jewish state. “As president, America will stand unapologetically with the nation of Israel – if I am president – because I am not neutral between terrorists who are blowing up and murdering women and children, and the people of Israel who are trying to defend their nation,” Cruz told Fox News. Cruz, who is struggling to draw conservative voters away from Donald Trump, came in second among Evangelical voters in South Carolina on Saturday. Evangelicals, who according to the Washington Post exit poll made up 72% of South Carolina GOP primary voters, favored Trump over Cruz 33% to 27%. Florida Senator Marco Rubio was close on Cruz’s heels, winning 22% of the Evangelical vote. Support from southern Evangelicals is crucial for Cruz to win the nomination, and support for Israel is one of the talking points he’s used to dissuade religious voters from backing Trump. Cruz’s comments to Fox News was not the only time he’s mentioned Trump’s “neutrality” vis-à-vis Israel. Speaking at a televised town hall meeting at the College of Charleston last Wednesday, Cruz slammed Trump’s comments. Trump’s statements drew boos from the audience, as Cruz made clear his staunch support of Israel over the Palestinian Authority.